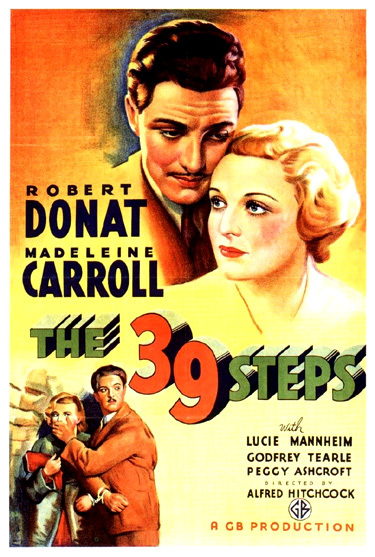 Uncharacteristically, a comical theatrical version of the film, officially called "John Buchan’s The 39 Steps," opened in 2007 in London's West End. It then premiered on Broadway in early 2008 as a fast-paced stage production, now more accurately titled "Alfred Hitchcock’s The 39 Steps," with a cast of four performers playing almost 250 roles. The tour-de-farce, breakneck-speedy adventure also included many allusions, puns and visual gags of other well-known Hitchcock films. The Thirty-Nine Steps, a contrived title, is Hitchcock's first film with a classic theme that he modeled repeatedly for the remainder of his career. It is the typical Hitchcockian story of an average, innocent, ordinary man who is framed by circumstantial evidence and thrust against his will into an extraordinary situation that he doesn't understand. This filmic model of the 'wrong man' was also found in Young and Innocent (1937), Saboteur (1942), and The Man Who Knew Too Much (1956), and culminated in Hitchcock's similar North by Northwest (1959) twenty-four years later - it is widely considered his "American Thirty-Nine Steps." Posters advertised: "A HUNDRED STEPS AHEAD OF ANY PICTURE THIS YEAR." Over a four day period, the suave, imperturbable and clever male protagonist (played by Robert Donat who had recently starred in the swashbuckler The Count of Monte Cristo (1934) and was popularly known as the "Monte Cristo Man"), is paired (literally handcuffed) to a classic, cool and icy, intelligent blonde maiden - Madeleine Carroll. [Note: She was the first in a notorious line of Hitchcock's female stars that later included Grace Kelly and Tippi Hedren.] One of the film's posters declared: "Handcuffed to the Girl Who Double-Crossed Him." His exhausting cyclical journey to prove his innocence and to bring the spies to justice, in which he assumes numerous identities (i.e., a milkman, an auto mechanic, a politician, and a newlywed), takes him from London to the Scottish Highlands and back again, through a series of action sequences. One of the film's major motifs is the confining, sexually-frustrating institution of marriage. [Note: There are three married couples in the film that provide the commentary: Margaret and her abusive husband John, Professor and Mrs. Jordan, and the innkeepers who encourage romance.] The film's two MacGuffins are the nature of the 39 Steps and the smuggling of secret plans out of the country - the mystery of which is only fully revealed in the final scene. Ladies and gentlemen, with your kind attention and permission, I have the honor of presenting to you one of the most remarkable men in the world. Every day, he commits to memory fifty new facts, and remembers every one of them. Facts from history, from geography, from newspapers, from scientific books...Test him please. Ladies and gentlemen. Ask him your questions and he will answer you fully and freely. Members of the audience are encouraged to ask questions of Mr. Memory to test his abilities. In a confused give-and-take within the crowded music hall, both boisterous hecklers and serious questionners present him with challenges about Derby winners, dates, "What causes Pip in poultry? ", "How old is Mae West? ", and "Who was the last British heavyweight champion of the world?" With his question, the well-tailored, anonymous audience member, Canadian hero Richard Hannay (Robert Donat) unconsciously identifies himself as a foreigner, a member of the upper-class who is visiting London from Canada: "How far is Winnipeg from Montreal?" Mr. Memory first responds with a joke: "Miss Winnie who, sir?" But then gives the correct geographical answer, ending his feat with: "Am I right, sir?" Hannay replies: "Quite right!" and the audience joins in applause. Beautiful and mysterious woman pursued by gunmen. Sounds like a spy story. He learns that she is a secret "agent" being pursued by two men sent to follow and kill her [agents of the 39 Steps (the trademark Hitchcock MacGuffin) - it refers to the code name for the organization of enemy spies and - the British secrets that they carry]. Thinking that she is afflicted with "persecution mania," he treats her 'life-in-jeopardy' story as unbelievable. She challenges him to go to the window and look down into the street outside. As he goes to look out the apartment window from another room and spies two men under a corner streetlight, Hannay carries a bread cutting knife and hugs the shadowed wall. Now convinced that she is telling the truth, he returns to the kitchen and admits that she is being stalked: "You win." Smith: Have you ever heard of the Thirty-Nine Steps? Smith: 'Cause they wouldn't believe me any more than you did. And if they did, how long do you think it would take to get them going. These men act quickly. You don't know how clever their chief is. He has a dozen names, and he can look like a hundred people, but one thing he cannot disguise - this: part of his little finger is missing - so if ever you should meet a man with no top joint there, be very careful, my friend. Annabella: There's a man in Scotland whom I must visit next if anything is to be done. Hannay: Are the 39 Steps in Scotland by any chance? Annabella: Perhaps I'll tell you tomorrow. What you are laughing at just now is true. These men will stop at nothing. There's a man in Scotland whom I must visit next if anything is to be done. It's only a matter of days, perhaps hours, before the secret is out of the country. The police will not believe me any more than you did. I tell you, these men act quickly, quickly, quickly. Milkman: Why didn't you tell me before, old fellow? I was just wanting to be told. Trying to keep me with a lot of tales about murderers and foreigners. (The milkman happily and freely offers his coat and hat)...You're welcome to it. You'd do the same for me one day. After a shot of the milkman's cart and pony waiting for its master, Hannay heads for her destination on the map by boarding the Flying Scotsman train to Scotland. As the train pulls away, his pursuers (Annabella's rival spies) are unable to catch the moving train.